Did you happen to notice that at a 2012 Arizona auction a �53 Corvette sold for $445,500.00? These rare and investment grade first year Corvettes have always commanded the heights of the Corvette collectors hobby and for good reason. 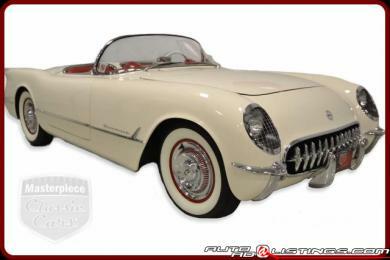 We all know the Corvette story and it is pointless to labor on it further, save to say that if you could own just one Corvette, who wouldn�t select the 1953 introductory model? Just 300 of this fiberglass example were produced and probably less that � are still placing their carbon foot print on the planet. Ours here is # 130. The same family has owned this historically important Corvette for 57 years which place this rare car in a league of its own. The 46,718 miles displayed on the odometer are close to accurate. Close because the odometer was not functioning for a short time and a few miles accumulated that were not registered. Still, extremely low mileage indeed, the car was stored away over several decades from the 60�s into the 80�s. Further proof of the limited usage can be found by inspecting the shocks on the car. Yes, they are the original shocks from 1953. Still, even with the low miles driven a car still can melt back into the Earth if not properly cared for and handled. This one has had the Polo White finish reapplied along with the top, chrome and interior all being tended to and restored or replaced. Whatever regiment that was deemed required maintaining this family heirloom has been aggressively followed. The benefit of that love is instantly recognizable and on offer here. The family has colorful pictorial history of the roadster along with a well presented narrative which adds nicely to the car�s provenance. The original 235Ci / 150 HP engine has never been apart and to this day runs out very well. The original 2-speed automatic transmission was rebuilt in 1999 and shifts properly. The original clock and the original radio have both been rebuilt and yes, they work just fine. To sum up, it is good to go, wherever you wish to take it. Pricing is still being determined at this time but understand please this one is positioned to command the heights of 1953 Corvette valuations. When considered individually, the car�s condition, history and long term ownership by one of America�s families are all interesting historic details. Taken together however, this car�s portfolio is remarkable and unmatched.